For over 20 years, Callender Howorth has specialised in all manner of West London interior architecture projects, from minor redesign projects to complete overhauls. Whether improving the interior architecture of a West London home or an office space, the experienced Callender Howorth design team is adept at optimising the interior of any type of property. We consistently exceed the expectations of our discerning clientele, delivering a spectacular finished product that optimises the functionality of your living or work quarters. As skilled West London interior architects, we work closely with our clients to personalise every project. View our range of high-profile interior design projects, completed in locations all over the world. Our West London interior architects recently transformed a deceptively chic Mayfair Mews House, which appears to be a charming Victorian property from the exterior, but once inside, guests are greeted by a contemporary design marvel. The project involved a complete gutting of the top floor to create a master suite. Likewise, the Kensington House project that was undertaken by the team involved a complete overhaul of two floors. 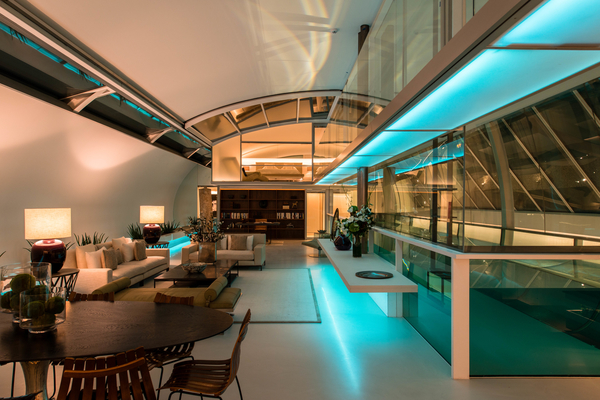 For this project, we also incorporated an extensive new basement space, which exemplifies the range of our West London interior architecture services. The Knightsbridge Penthouse project, located near Harrods, saw us giving life to a run down apartment, in which we installed the latest gadgetry to the delight of the client. Many of London’s architectural marvels stand regally in the west of the city, including Harrods, Kensington Palace, Buckingham Palace, The Royal Albert Hall and the Natural History Museum. Many of the residential properties surrounding these buildings are majestic in appearance, usually forming large terraces of imposing stature, with colonnades and stylish facades. As progressive West London interior architects, we take inspiration from our surroundings, channelling the environment’s style into the projects we undertake. West London houses the majority of the capital’s museums and exhibitions, making the region a cultural honeypot. Locals and tourists indulge in the various institutions that shape our nation’s culture: The Serpentine Gallery, The Science Museum, The Natural History Museum, The Royal Albert Hall, The Victoria and Albert Museum and The Saatchi Gallery, to name but a few. The Chelsea Physic Garden is a fine exhibition of a quintessentially British garden, which characterises the area most favourably. West London is a hotspot for chic clubs, fine restaurants and exclusive hangouts. Set in the stunning gardens of Kensington palace, The Orangery – an award-winning restaurant – is one of West London’s hidden gems. Foxlow restaurant in Chiswick is also a highlight of the district, serving a range of sumptuous dishes from a relatively modest menu. La Trompette is at the high end of the restaurant scale, serving fine French cuisine. Many cultural attractions also characterise West London, including art galleries, museums and exhibition spaces. Why do you want to live in West London? Which famous residents live there? West London is an extremely desirable place to live, whether raising a family, forging a career in the city, or enjoying a sociable lifestyle. With regards to educational institutions, parents are attracted to the area by Lady Margaret School, Hurlingham and Chelsea Secondary School, Sacred Heart School and William Morris Sixth Form – each of which consistently functions at a very high standard. Please contact our team of West London interior architects to discuss your requirements. Complete design, build and project management service in West London.